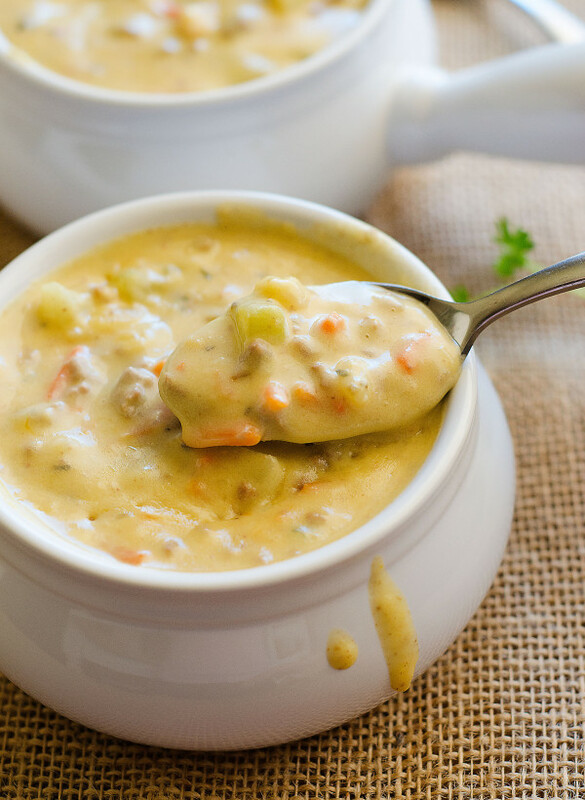 Crock Pot Cheeseburger Soup is a creamy and cheesy soup loaded with potatoes, ground beef, carrots and more. 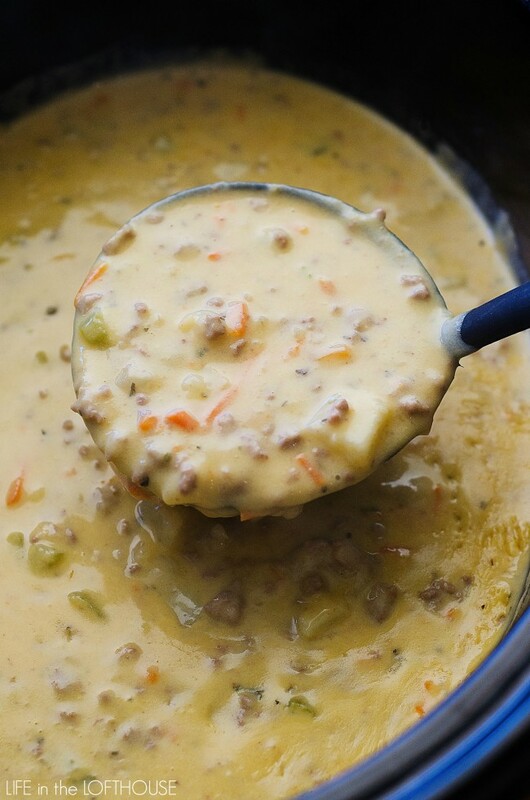 This cheeseburger soup is a family-favorite! 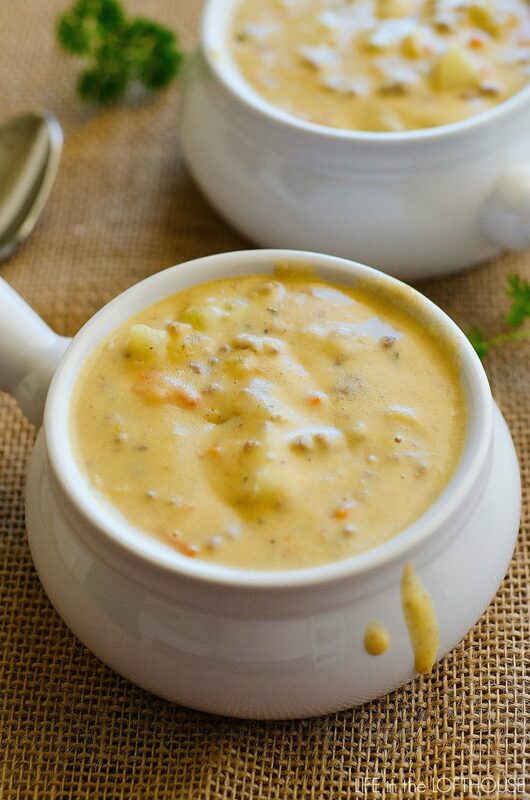 This Crock Pot Cheeseburger Soup is one luxurious soup. I mean seriously, it’s award-winning! I’ve had this recipe PINNED on one of my food boards for a looong time and I finally made it the other day. After I scarfed down two bowls (in about 2 minutes) I was kicking myself for not making it sooner! This soup sounds so good! Perfect for a chilly fall evening! Made it! Devoured it! You are my new best friend!! I just made this.. but I didn’t have potatoed…but I had some frozen hash browns. YUM. I used half and half rather than milk and then cut the processed cheese in half. I was so thick I didn’t need to use flour. Which gave me a gluten free yummy soup. Myra, I’m not too familiar with almond milk. So not too sure if it would work but I think it’s worth a try! I USED IT AND IT WAS PERFECT!! I make this for church meal deal night except I use 3 cups of cooked rice in stead of potatoes can add 1/2 of green pepper our preacher ask for this everybtime I volunteer to cook! Thanks for this! Only thing I took out was celery and added heavy cream a small amount and out cheese it’s on top in my bowl an so mixed it in!amazing! This sounds like a great meal to make for Halloween! Filling up the bellies before all the candy eating starts. The browned ground beef can’t go in at the beginning, when you add everything else? Yummy and a little heat is good! I am allergic to Basil so I added pickle juice to the first step to get that tangy flavor and a little Italian seasoning as well. I also added my flour to the hamburger after I drained some of the fat so that I got my flour fully cooked. This is a great recipe to double, I just dumped it into my big stock pot for the final 40 minutes. When you need a large portion it’s economical, except for Velvetta maybe. Hello, what if I don’t have an potatoes, can I use rice or mashed potatoes? A previous poster uses 3C rice, she didn’t say if that’s cooked ahead or not tho. I haven’t used rice in my crockpot in years but I seem to remember that when I did I did not cook it ahead. Looks delicious! But, could yiu add tomatoes? If so, when, and would canned be ok? Could this be made on the stove also? I made it on the stove. Absolutely loved this! I added a can of rotel and omitted the celery and carrots. Served it with crusty warm French bread to make a real cheeseburger meal! Yum, thank you, this is a keeper! I made this soup tonight. It was yummy. I took out the onion & potatoes. I used 1 tsp onion powder. (stomach is sensitive to onions) and 1 lb of frozen diced hash browns. I used 2 cups of shredded cheddar jack cheese. Loved it! I served it with french bread. We couldn’t stop at one bowl either….. I made this for dinner last night, and loved it! I didn’t change anything, nor would I. Not one person complained and that’s huge in my house lol. Is there another way to make this that’s quicker than the crock pot? You could do the Crock Pot step on the stovetop. Those veggies would cook tender in 15 minutes or so. Then proceed with the rest of the recipe. Since most of this is done stovetop, it’s kind of a waste to take 6-8 hours slow cooking the vegetables. (Now you could make it stovetop & keep it warm in the Crock Pot!) Looking forward to trying this one! I used this recipe but made it on the stovetop instead. Only took about 30 minutes, perfect for a quick after work meal. I also cooked the hamburger first and just added all the ingredients to the hamburger. Just tried this recipe last night. It was freaking excellent! New family favorite! I used an unsalted chicken broth, and shredded cheddar (instead of velveeta). Also, I topped mine with a little chopped dill pickle…it was amazing! Definitely try it if you haven’t. Thanks! this looks so good! What could be used instead of chicken broth? Thanks! There is a no-chicken chicken broth that I use instead of chicken. I love it. I made this before and making it again cause it went over so well. I’m allergic to chicken, so I used turkey broth instead. Veggie broth would be good as well. Can’t tell a difference, you could just use water if you wanted to. Hope you enjoyed this. I am going to make this for a work party and want to make it the day before. Has anyone made it then reheated in the crockpot? Just wondering if it turns out as good. I make this for all of our soup potlucks at work. I make it the day before, in my crockpot, and it warms up just fine. Takes an hour or 2 to completely warm up. I don’t add the sour cream until i’m ready to serve. I made this tonight and it was delish. BUT. The potatoes didn’t cook? I cut them very small like the recipe states. I used the crockpot on high for 5 hour’s. I’ve never had this issue with my crockpot not cooking stuff all the way through. I’ll have to try it again sometime. It’s really good, but I’m just trying to fight through the uncooked potatoes! We loved it, it’s great ‘comfort food’ in winter. The dried basil is yummy in this recipe! The only thing I did different was to use the cooktop rather than crockpot. Thanks for sharing! You can brown the meat in the crockpot, then drain, then add veggies & broth. I would swap out the carrots and potato for more onions, and jalapenos/Hatch chiles for a green chile cheeseburger soup. I’m doing lowcarb so no flour/roux stuff. My 5 yr old son and I made this 3 days ago. I’ve been asking him if we should make this since last year. That night he had 3 bowls. That same night he begged me to let him take some to school for lunch, he did. Then that night he came home asking for it for dinner. Lol. I can’t blame him I did too. I followed everything only I used too much onion, my fault for not paying attention. Used 1% milk. And Velveeta block cheese. I thought using 2cups of milk plus the chicken stock and crock pot moisture would make it watery, but it didn’t. So glad I didn’t add more Velveeta. I never follow recipes, and rarely leave feedback, but this was soooo good. Thank you for sharing! I loosely followed this recipe but added ground mustard, dill (to bring out that pickle flour), and a little chili powder along with pepper and salt to taste. I also made it on the stove and left the crockpot out of this. I also added diced dill pickles for a little pucker and more chicken broth and vegetables for a less decadent soup that stretches for a few more meals. This recipe is divine! Also, a big thank you to Holly for her description for making a roux; usually it ends up lumpy, but this one was perfect! Cheeseburger soup was one of those soups I kept wanting to make. 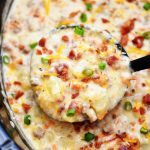 I recently made one similar to this recipe and had a little resistance from the family, especially my husband. One taste and they were hooked. 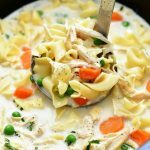 I love soup so I am so glad I have another recipe to add to our favorites. 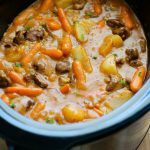 Now I have this one that uses my crock pot and to me that is a win-win! Did you use velveeta or cheddar? Really good! The only change I made was to use an immersion blender and purée the veggies before adding the beef. Definitely a keeper! This soup was AWESOME! I want to freeze leftovers, do you think it would be ok? I froze the leftovers. My husband took them to work and said it was still fantastic!! I just made this, doubled the recipe, and more than half of it is gone because everyone wanted seconds, some of us thirds. Delicious. I followed The recipe pretty closely, but made a few changes. I didn’t use Velveeta brand cheese, but a knock off of the same thing. I also added Ground Mustard, Chili Powder, and Dill weed to the veggies and broth while they were cooking, and doubled (well, quadrupled) the called for parsley and basil. I also browned the beef (I used 1.5 lbs [doubled] just because that’s what came in the package, but nobody seemed to mind the extra meat!) with a little chili powder, salt, pepper, and dried minced onion. This was delicious. Creamy, cheesy, and awesome. Will double recipe fit in 7qt crockpot? I am looking to make this soup soon. Can anyone tell me if I could use frozen diced potatoes? I know have some in my freezer now. Just trying to use what I have. Thanks so much! About how much did this recipe make? I would love to make this, but I live alone. Does this freeze well? After browning and draining the ground beef, add a little catsup and mustard to the meat and mix well. Brings out the ‘cheeseburger’ flavor. Yum! This was the best soup we have ever had! My entire family raved on it and my kids which dont eat potatos or veggies, ate a huge bowl of it, raving the entire time! The only complaint i have is it made us terribly thirsty and extremely full lol now we are all sleepy! Gonna def share this recipe and cook it a whole lot more! After reading the comments I had to try this soup. I am always afraid to try a recipe if there aren’t many comments. It was really good! Thank you! I did also half the velveta like I saw others did. Velveta has such a strong taste I wanted to try half first. My very picky 2 and 3 year old love it. That is such a plus! I made the copycat red lobster biscuits to go with it and it was a great match. Wondering if u can do on stove top in dutch oven instead of crockpot?? Just made this for the family. It was a hit with everyone ages 15-86. I will be making this again, SOON. Just made this – it was so yummy! Everyone really liked it. I probably had 2 cups of cheddar in it and added corn. Next time I will add some mushrooms (didn’t think of it in time). Can you use beef broth instead? I made this soup earlier this year and am getting ready to make more tonight. It is one of the best soups I have ever had! Thank you for the recipe! This was OUTSTANDING! By far the best soup I’ve had in a long time. My only complaint was my potatoes weren’t completely cooked after 6 hours on high and cutting them small. Next time I’ll boil them a bit before putting in the crock pot. Will make this again for sure! I added garlic powder and Worcestershire sauce to add some flavor and cooked this in the stove. It was yummy. I made this today in the crock pot, super yummy! Inadded a little pinch of thyme and rosemary, as well as using more Velvetta. I made this on the stove tonight. Didn’t plan ahead of time for dinner and knew I had everything except celery. 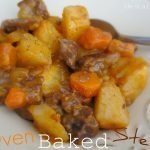 I browned the beef, added onion, carrots then potatoes. Put in chicken broth and simmered 20 minutes,until potatoes were done. Made my roux in a small saucepan, cooked a couple of minutes then added to my simmering beef mixture. Whisked until incorporated then added milk then 2 cups of shredded Colby & cheddar cheeses. Added pepper and parsley (instead of basil). Served with grilled cheese sandwiches and my husband, who doesn’t like soup, said it was good! I think it took just about 30 minutes to make it. Will make it again. Just made this soup today….excellent! Followed the recipe step by step. Once the soup was in bowls, I topped each with a little shredded lettuce and some diced tomato. Added a little more burger experience. This soup’s a keeper! 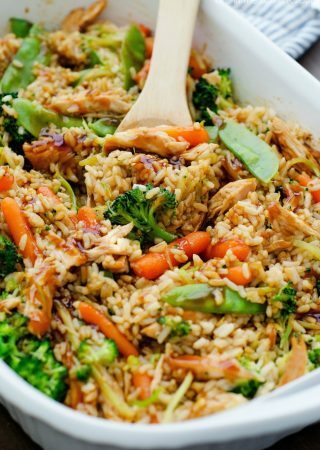 I made this multiple times and it is always a hit! Instead of velveeta which I used the first time, I used extra sharp cheddar it was even better! I saw another comment and was wondering the same how it would turn out with beef broth! I would like the nutritional info for crockpot cheeseburger soup. I did not have celery so I left it out but I added corn and a small can of diced tomatoes. Also used beef broth instead of chicken and I used parsley instead of basil. Also added a touch of garlic and real bacon bits. Bottom line is use what you have, add what you like, make it your own. . I did it all stove top. It is delicious! Sent the link to all my kids. My parents have made this soup for our family for YEARS. It is a favorite. However, I didn’t have a big enough pot to cook it in my new home but then I found this one for the crockpot :). When I made it, I added an extra potato, an extra carrot (i shredded them myself), and an extra stalk of celery. I also added about an extra 1/4 c. flour into the soup after the cheese and whatnot to thicken it more. I also used a different brand of cheese (Clancy’s from Aldi’s), and it came out PERFECT. Exactly like my family makes it. Thank you for the recipe! I made this low carb! I did almost 2 lbs of ground beef, subbed chopped cauliflower for the potatoes and only added about 1/2 cup carrots. I browned my butter then whisked 1/2 tsp xanthan gum into the melted butter. Then I quickly whisked in 1 cup of heavy whipping cream and 1/2 cup of sour cream until thick then added to the crockpot! Then added 2 cups of shredded cheddar cheese! Tastes great! This recipe was yummy, I even got a thumbs up from my picky husband!! We sprinkled a touch of shredded cheese on top and served with saltines, very filling!! Does anyone know how well this soup freezes? I would say a slalad would go very good with this soup!! It’s very rich and creamy, so you would probably want to keep it pretty light. I bought a loaf of everything French bread to dip into it and it was amazing!! Do you have to wait to add the hamburger and milk/flour mixture? I would like to be able to add it all in the morning and then have it ready to eat once I come home to save time. This soup is absolutely delicious and even my picky 4 year old loved it! I made it with unbranded velvets and I couldn’t tell a difference, and I used ground venison and browned it with a dried minced garlic seasoning and seasoned salt and pepper. I also garnished with more shredded cheese and bacon bits and green onions! It’s a huge hit in my house, my husband said to double the batch next time! The leftovers are wonderful! I just made this tonight after a snowy day outside! Delicious! The whole family liked it. I made it with cheddar cheese, I just can’t do Valveeta! Thank you for sharing. 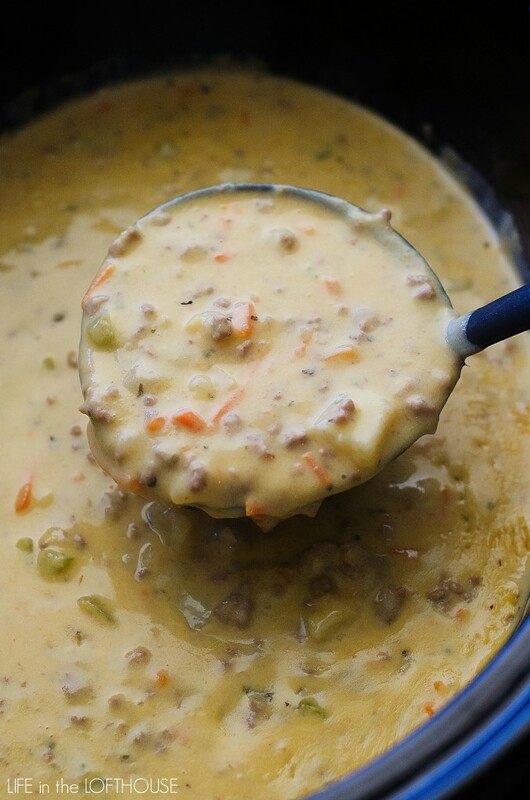 Yesterday, I made the crock pot cheeseburger soup just as the recipe is written. (I always start that way!). It was fabulous. I like my veggies in chunks, so never tried to blend them; they were tender but not mushy! Big hit here, so will definitely be making it again. 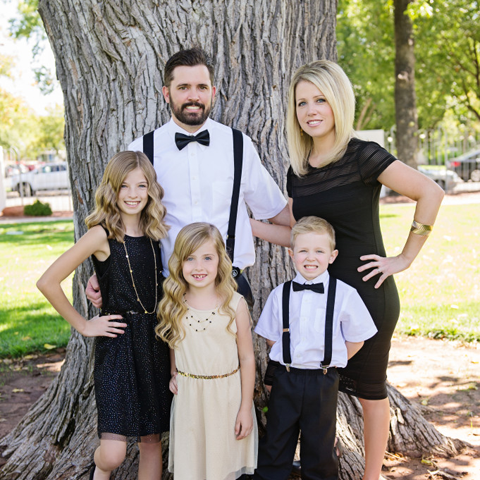 Someone suggested pepper jack cheese – husband really up for that addition. Great recipe. Turned out perfect! This soup is surprisingly delicious! However, I have to admit that I often put more ground beef and vegetables to make the cheese taste lighter, it sounds awkward but I love make balance of all the ingredient’s tastes. I have made this soup yesterday. Bla bla… this is wonderful! Adopted the recipe step-by-step. As soon as the soup was in bowls, I topped every with a bit of shredded lettuce and a few diced tomato. Added a bit of extra burger expertise. My all family member are HAPPY and HAPPY. . This soup’s a keeper!. Thanks for sharing the GREAT soup recipe. This was so tasty! Everyone in our family loved it! Made your cheeseburger soup tonight, but I made it dairy free and gluten free. Used melt sticks for the bitter, and vegan cheddar shreds, almond milk, and great value gluten free flour. I also added nutritional yeast. Think I will cut the flour next time. Otherwise it is definitely delish. It’s looking so yummy. I’ll definitely try this. I was wondering what size crock pot you used? I’m making this right now and it’s not quite half full. Since it should always be at least half full for even cooking I’m just wondering (for next time) if you used a smaller one than mine which is 6 quarts. I’d love to know what size you use on all of your recipes! Thanks in advance. Hi Patrick! I actually one use 7 quart crock pots. When I make this soup it definitely only fills barely half.